Mitsubishi announces pricing for its all-electric i-MiEV + Road Test…. 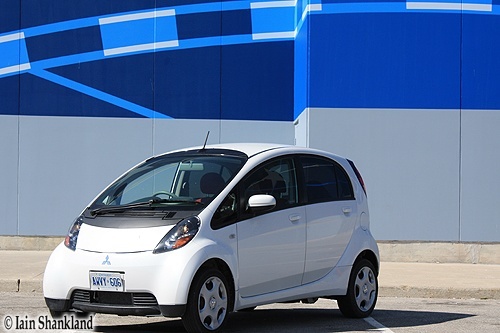 Toronto, Ontario – Mitsubishi has announced pricing for its all-electric i-MiEV, which will start at $32,998 when it goes on sale later this year. The company said that the four-door, four-passenger subcompact hatchback will be the most affordable mass-produced all-electric vehicle in the Canadian marketplace. The i-MiEV has a top speed of 130 km/h and a targeted range of 135 kilometres, which will make it “an excellent commuter vehicle for many Canadians living in urban areas,” the company said. The standard i-MiEV will have an MSRP of $32,998, while the top-line i-MiEV with Premium Package will be $35,998.Ontario and Quebec have already announced subsidies for the purchase of electric vehicles. Ontario’s credit of $8,230 will reduce the i-MiEV’s net MSRP to $24,768, while Quebec’s $7,769 credit will reduce it to $25,229. Quebec will also offer a 50 per cent subsidy on the purchase and installation of a home charger to a maximum of $1,000. While the base Lancer without the lower body kit and rear wing is no dog, the GTS adds enough looks and pizzazz to make it a far more attractive car. 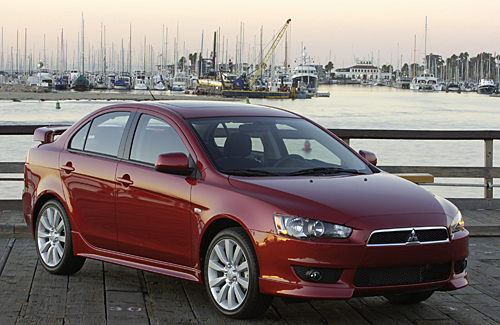 But it’s not just different in the looks department – for 2009 the GTS got a bigger engine and therefore becomes a completely different car from other Lancer models. The GTS is such a different car from the DE that I had to do a completely separate road test for it. 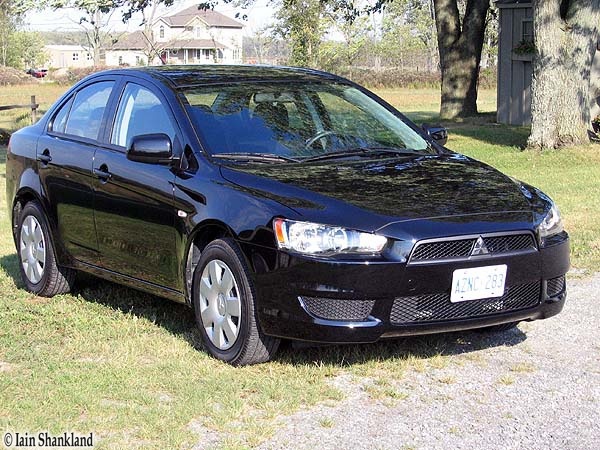 I’ve already covered the majority of the good and bad points of the Mitsubishi Lancer, so I won’t re-hash the entire experience – I’ll just give the brief version here because they differ enough to justify a completely different review, and it simply would have been too confusing to combine the two. Sweaty palms, shortness of breath and a racing heartbeat. I didn’t know it yet but I had fallen in love. That was the first few seconds of my experience behind the wheel of the 2010 Evo – I hadn’t even left the parking lot yet and it was more than I had expected!!! Driving at barely faster than idle, I felt like Charlton Heston in “Ben-Hur” when he was holding the reins of those four stallions while steering a chariot. The Evo feels like it’s on a razors edge, but not uncomfortably so. After a day though, the feeling subsides and it’s just like every other car, albeit with tons of get up and go. All but the base models come with remote door locks or with Mitsubishi’s F.A.S.T. system – where you don’t even use a key to start the ignition- in fact you don’t even have to take the fob out of your pocket. To open the driver or passenger door you just put your hand behind the door handle and pull. To lock it you just press the little black button on the door handle. Personally I think this works much better than BMW’s version and it costs many thou$ands of dollars less on the Lancer GTS. One minor incident I did have was when I had the engine running and I got out to open the trunk. Even though the fob was in my pocket it wouldn’t open – I had to go back inside the car to pull the lever – it’s not a big deal, but was annoying and inconvenient at the time. All Lancers have a tilting steering wheel that doesn’t adjust telescopically for reach – a little odd in this day and age when most cars are moving in that direction. Nevertheless, it’s perfectly placed so maybe Mitsubishi are on to something here….. Adjusting the driver’s seat is easy and there is a crank lever to give you some height if you require it. From the base unit on up, the plastics used throughout the cabin are top quality and not exactly what you’d expect in a car at this price point. Fit and finish was exemplary, but the dash and center console drew comments such as “very 1970ish.” Panel gaps were extremely close and worthy of far more expensive vehicles. All Lancers appear to have the same fake carbon-fibre band that goes from door to door and across the centre of the dash. While it does an excellent job of imitating the real thing, more importantly it breaks up a very dark and black interior. For the GTS test vehicle we were treated to comfortable leather seats with two-stage seat heaters that worked very well. I had expected lumbar adjustments, but they weren’t included. Last year Mitsubishi used the same 2.0 litre 4-cylinder engine throughout the line up, but from 2009 and on, the GTS gets a different engine, a 2.4 litre, DOHC, MIVEC, 16 valve, 4-cylinder engine producing 125 Kw @ 6,000 rpm and 226 Nm torque @ 4,100 rpm. (the other models use a 2.0 litre, DOHC, MIVEC, 16 valve, 4 cylinder engine producing 113 Kw @ 6,000 rpm and 198 Nm of torque @ 4,250 rpm). To say the improvement was noticeable would be an understatement. Although the 2.0 was no slouch, the 2.4 engine is far quieter and I’d never complain about more horsepower in any vehicle. Oddly enough, the GTS was noisier than the base model – more in line with other vehicles in its class. The engine was extremely well insulated to the point it was indistinguishable, but road noise was not as hushed as expected. The engine and optional transmission (CVT with 6-step Sportronic mode and steering wheel paddle shifters) work in perfect harmony – giving you the fun factor if you want or a set and forget option if that’s what you require. 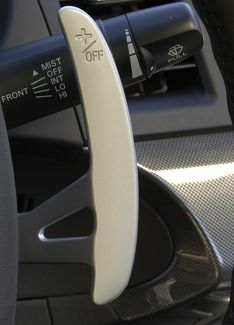 You can use the paddle shifters at any time – no need to actually shift the lever into the +/- slot unless you want to use the stick to shift. One thing that did catch me by surprise was when I geared down for a corner and eventually came to a stop at a traffic light. The transmission actually geared all the way down to first and when I took off from the light it held the gear until I changed it. Other similar systems (Audi’s comes to mind) only let you have a little bit of control – it would have resumed full automatic mode after the car had come to a stop – nice job Mitsu! The audio system in the GTS was nothing short of spectacular. 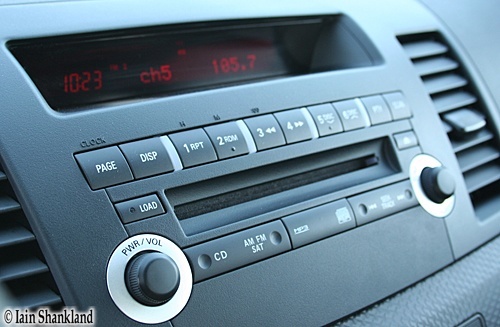 The unit that comes standard is a 140-watt CD/MP3 head unit with 6 speakers. Included in the test vehicle was the optional Sun & Sound Leather Package – for $2,700 Cdn you get: an AM/FM/MP3 650-Watt Rockford-Fosgate® Punch® premium sound system with 6-disc CD changer, 9 speakers including a 10 inch dual voice subwoofer with speed compensated volume & equalization, Power glass sunroof and FAST keyless entry with panic alarm as well as leather front seating surfaces. Oddly enough, this package comes standard in the GT version of the Lancer but you do lose a lot of other key ingredients that make up the GTS. Rear seat accommodation is spacious and comfortable for a car of this size. There’s plenty of room for 3 passengers with lots of knee, foot and leg room and the rear seat angle is perfect. Rear head room is quite plentiful, with hip room abundant for two but obviously less-so when there are three passengers. Unlike the base model, the rear seat splits 60/40 offering a very good 354 liters – just 2.83 liters less than the benchmark Honda Civic’s. 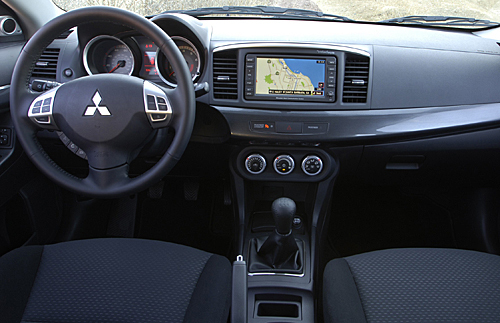 As mentioned previously, even the base model Lancer comes with a large number of standard and safety features – among them are a Multi-information LCD display (trip meter and odometer, outside temperature, average fuel consumption, and driving distance to empty, service reminder, drive mode indicator, water temperature warning lamp and low fuel warning); Power windows with drivers side auto down/up; 140-watt CD/MP3 audio system; Anti-lock brakes (ABS) with Electronic Brakeforce Distribution (EBD), Anti-theft engine immobilizer; Height-adjustable front shoulder belts with pre-tensioner, Tire pressure monitoring system; Driver’s side knee airbag; Hands-free Bluetooth® cellular phone interface system with voice recognition microphone; Front seat mounted side impact air bags and Side-impact curtain airbags for front and rear occupants. The GTS adds larger brakes along with sport tuned suspension with heavy duty front and rear stabilizer bars and strut tower bar. I liked the base ES version a lot more than I would have expected. The GTS was even better and seriously should be considered if you’re in the market for a four-door car. The GTS is solid and fun to drive with no complaints coming from rear passengers on extended journeys. It looks great and the price is exceptional when you consider the extra content Mitsubishi put into it – never mind the outstanding safety features and the longest warranty available right now. This is one car I’ll definitely be recommending to people that want a good reliable reasonably priced car. Can’t think of any… honest! Please visit your local dealer for the latest prices and incentives. Towing capacity: Do not tow with this vehicle. I averaged 9.6 L/100 kms during virtually 100% highway driving. We test the iMiEV – the gas version of the electric iCar, with the steering wheel on the wrong side! I first saw the iCar at the Toronto Auto Show in February 2009. At the time the president of Mitsubishi Canada was telling the auto journalist crowd that he was rooting for the iCar and doing everything in his power to convince the powers-that-be in Mitsubishi’s Japanese HQ that it would be a perfect fit for Canada (I wasn’t at the Detroit show, so perhaps the president of Mitsubishi U.S. said the same). The car we were actually being introduced to at the time was the iMiEV (Mitsubishi Innovative Electric Vehicle) – an all-electric version of the iCar. The iMiEV will go on sale in the summer of 2009 in Japan, with it projected to arrive on these shores within the next year or so after that. The announcement was interesting and exciting. I for one think there is plenty of room for more electric vehicles in the grid-lock that is a major concern in cities around the world. The Mitsubishi Lancer was last redesigned for the 2001 model year, so needless to say it was long overdue for a face lift. 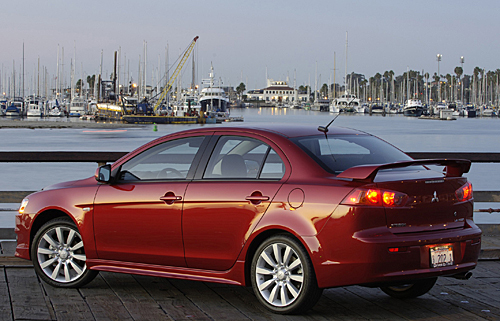 Not a moment too soon, with 2008 came the all-new model, and it’s a looker. Based on the 2005 Concept-X show car, many of it’s features were retained for the actual version available to the public. 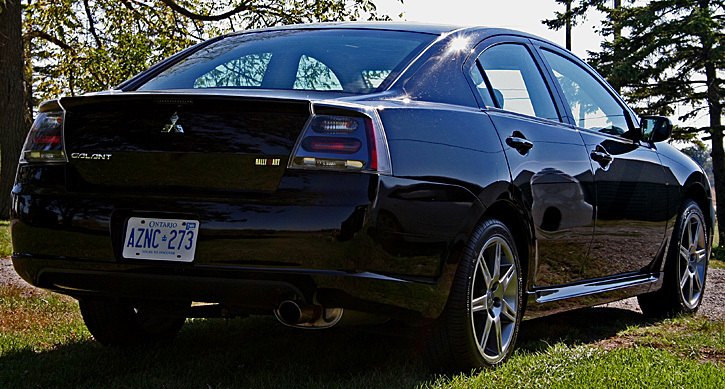 The Mitsubishi Galant was re-designed for the 2007 model year and since I liked the 2006 model so much, I thought I’d take another look at this new car. In the summer of 2006 I drove the top-of-the-line GTS model. 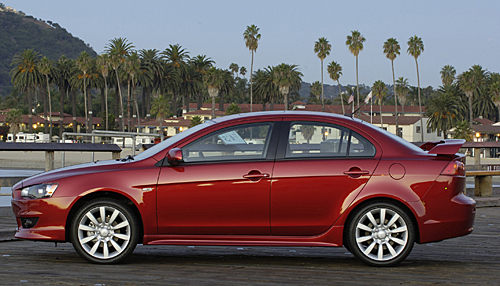 For 2007 and beyond, the top-end Ralliart name returns to the Galant fold. 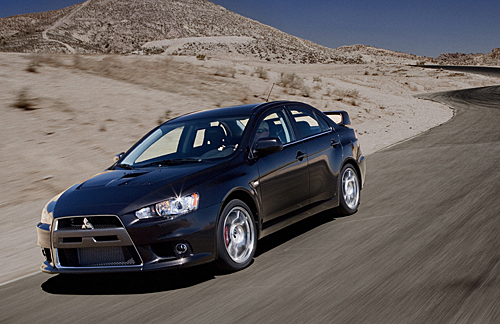 Much like the GTS – the Ralliart comes only one way – fully loaded with no options, including satellite navigation. That’s one thing that I really like about Mitsubishi – the model ranges are very simple and the prices reasonable for the many extras that are included within the various models.